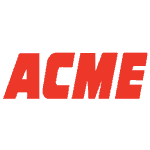 Acme Markets, Inc. is a growing chain of grocery, including fruits and vegetables. They are an intrinsic division of Supervalu, dealing in wholesale and retailing grocery. Established in 1891, the company is the second-largest food retailer in the region of Greater Philadelphia. Their corporate office is located in Ambler, Pennsylvania. They are carrying out the retail and wholesale business with over one hundred and fifteen supermarkets under the banner of Acme and Acme Sav-on. Currently, they are also operational in the regions of Maryland, Delaware, Pennsylvania and New Jersey. They have even launched an online service for ordering grocery by clients, in the region.